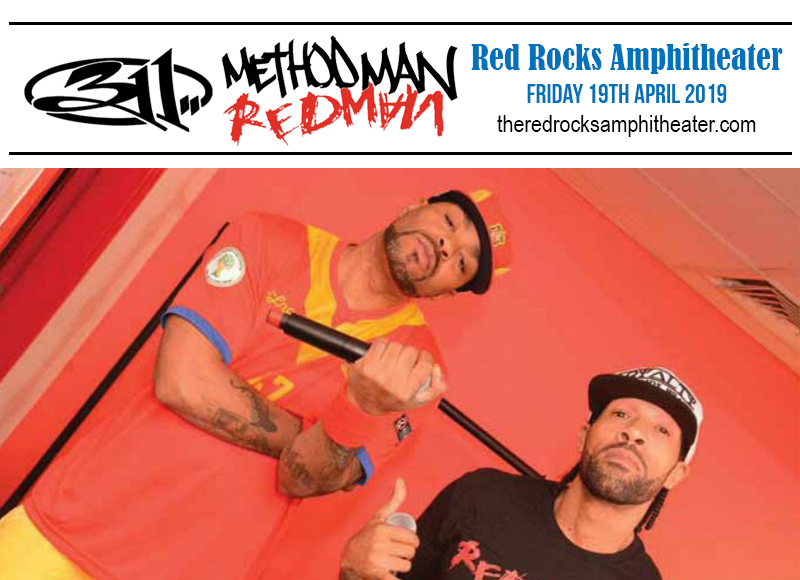 If old skool hip hop beats are your kind of jam, then nothing comes close to the triple threat that is 311, Method Man & Redman. These hip hop masters are set to raise the roof as they hit the stage of the Red Rocks Amphitheater on Friday 19th April 2019. Hip hop fans are reacting quickly and are not missing a beat to get tickets to the show. Just click 'book tickets' right about now! Redman, Method Man's cousin, started out for a guest appearance on an EPMD album in 1990. His debut album “Whut? Thee Album” came in 1992, and in that same year he was named “Rap Artist of the Year” by The Source Magazine. The duo started collaborating on "Got My Mind Made Up" for Tupac Shakur's album All Eyez on Me in 1996. 311dabbles on hip-hop with a mix of rock, rap, reggae and funk. With album sales hitting over 8.5 million units, they have released ten studio albums, one live album, one greatest hits album and three DVD's. Together, this hip-hop triad will deliver a dope performance that will keep the cool in old skool. Don't miss out on this one!